It’s never the wrong season to scrutinize what floats into and around our homes. Spring is an especially important time to look at indoor air quality, since all of winter’s dust is heading out and the dry summer months are just ahead. 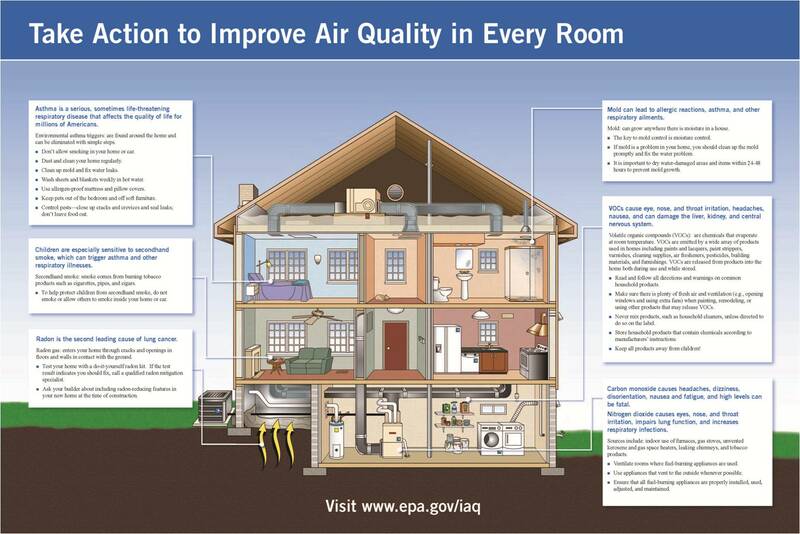 Here are some simple strategies to help you boost your indoor air quality. This graphic is tiny and probably unreadable, so you can click to enlarge it. In addition to these preventative measures, don’t underestimate the cleansing power of nature in your home. Though we live between four walls, we can invite sunshine and green plant life indoors as part of a holistic system that, in conjunction with the tips below, will keep our home air fresh, safe, and breathable. Turn on hood fans when cooking to help expel fumes. Cooking, especially on a gas stove, releases chemicals that can contaminate the air, such as carbon monoxide. Use the fume hood fan when cooking and make sure it is vented directly outside the house. Turn on the exhaust fan when showering to limit moisture build up. Run the bath fan during showers to remove the heat and humidity; if you don’t have a bathroom fan, a small portable fan will do the trick. And keep the shower curtain or bathtub sliding door open after bathing to increase air circulation. Clean regularly to prevent dust, dirt, and pet-hair accumulation. A clean house is a healthy house. Every day, dirt and dust collect in our home. We track it in on our feet and shed it from our clothes and skin. These particles can become airborne, contributing to the pollutants and biological contaminants in the air. Regular cleaning can help limit the problem. Install low emitting furniture and finishes. New or recently installed building materials and furnishings can emit VOCs. Look for products that are certified for low chemical emissions, and open windows when using paints, adhesives, sealants, and other materials that tend to offgas during installation. Use cleaning products that do not emit chemicals into the air. Many products used to wash floors, countertops, and windows can offgas toxic or irritating chemicals. Avoid dangerous chemicals by selecting products that are certified for low levels of chemical emissions. Open windows to allow fresh air into your space. To achieve energy efficiency, we seal up our buildings and tend to keep our windows shut, trapping pollutants inside. From time to time, it’s good to open the windows and allow fresh air to move through our spaces, flushing out any stale or polluted air. Maintain your HVAC filters as instructed. Check, clean, or replace furnace and air filters regularly, at least every two months. Consider installing a “high efficiency particulate” (HEPA) filter.